See more objects with the tag multicolored, color gradation, analogous color. 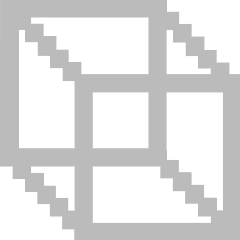 See more objects with the color saddlebrown silver darkslateblue dimgrey sienna or see all the colors for this object. 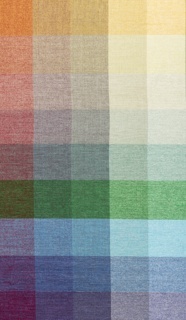 This is a Color blanket. It was produced by Momentum Group. We acquired it in 2013. Its medium is 54% cotton, 30% solution-dyed nylon, 15% post-consumer recycled polyester and its technique is jacquard woven. It is a part of the Textiles department. In tandem with her artistic practice, Sheila Hicks has been engaged with the fields of architecture, design, and textile industry for over 50 years. Crossing Colors is Hick’s latest commercial collaboration. Working with Momentum Textiles, she has created a collection of three patterned weaves (Painting Strokes, Drawing Lines, and Crossing Colors) with coordinating solids (Weaving Palettes). 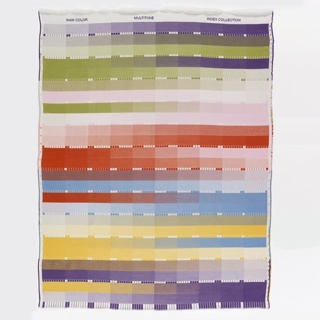 Early in her career, Hicks created commercial designs for Knoll Textiles in Pennsylvania and Commonwealth Trust in Calicut, India. Inca, a design based on her Yale master’s thesis and her study of pre-Incan textiles, remained in the Knoll catalog for 24 years; Badagara has been in continuous production at Commonwealth Trust since the mid-1960s. 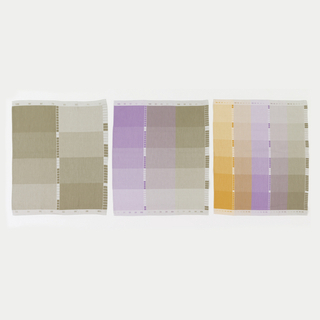 Unlike her work from the 1960s, which was both hand-woven and designed at the loom, the Crossing Colors collection faithfully interprets drawings from Hicks’s Couleurs Croisées series of drawings in graphite and felt tip pen on paper or canvas. Working from the original drawings, Momentum took great care to preserve the evidence of the hand. Two of the designs have full-width horizontal repeats, an unusual feature that preserves the continuity of the line and the illusion of filling a sheet of paper. In her artwork, Hicks often builds spaces with color and line; the Crossing Colors collection directly draws on this long-standing practice. Together, the group of textiles proposed for acquisition enables us to discuss more deeply Hicks’s fluency in moving across the fields of art, architecture, and design. This object was donated by Momentum Group. 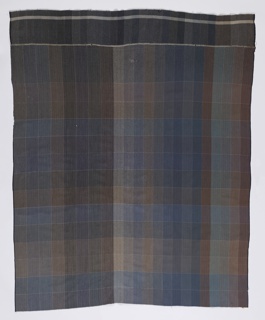 American Textile History Museum Collection, gift of Clif Lund-Rollins. 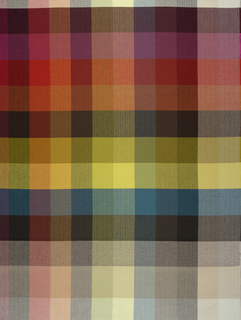 American Textile History Museum Collection, gift of Stanley Tanenbaum.